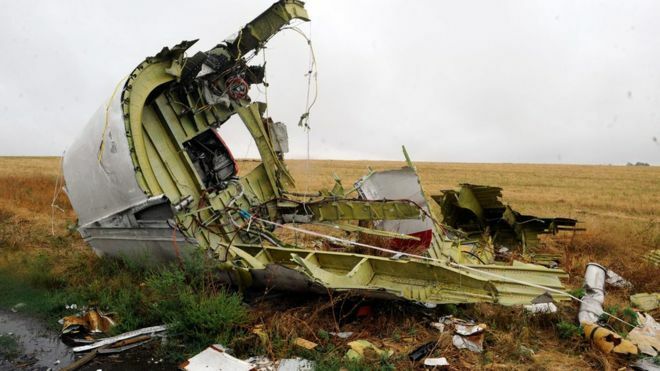 BRUSSELS, Belgium -- Australia and the Netherlands say they are holding Russia responsible for downing a Malaysia Airlines passenger jet in 2014. The remains of the Boeing 777, photographed at its crash site in 2014. All 298 people on board MH17, which was en route from Amsterdam to Kuala Lumpur, died when it was shot down over rebel-held territory in Ukraine. On Thursday, Dutch-led international investigators concluded that the missile belonged to a Russian brigade. Russia has denied any involvement in the plane's destruction. Moscow's defence ministry said it "rejects the version of the Dutch investigators". It has previously insisted that none of its weapons were used to bring down MH17. The team of international investigators, however, found that "all the vehicles in a convoy carrying the missile were part of the Russian armed forces". It was fired from rebel-held territory in eastern Ukraine. When it hit the Malaysia Airlines plane, it killed 193 Dutch nationals, 43 people from Malaysia, and 27 from Australia. Other victims came from countries including Indonesia, the UK, Belgium, Germany and the Philippines. The Netherlands and Australia say it violated international law. "On the basis of the [joint international team's] conclusions, the Netherlands and Australia are now convinced that Russia is responsible for the deployment of the Buk installation that was used to down MH17," Dutch foreign minister Stef Blok said. The statement added, however, that holding a nation state responsible for a breach of international law would involve "a complex legal process". "The only conclusion we can reasonably now draw is that Russia was directly involved in the downing of MH17." Australia and the Netherlands have asked Russia to enter talks as a first step, but held out the prospect of taking the case to an international court. A damaged missile is displayed during a news conference by members of the Joint Investigation Team, comprising the authorities from Australia, Belgium, Malaysia, the Netherlands and Ukraine who present interim results in the ongoing investigation of the 2014 MH17 downing. "We call on Russia to accept its responsibility and cooperate fully with the process to establish the truth and achieve justice for the victims of flight MH17 and their next of kin," Mr Blok said. Within a few hours, the EU, NATO, and British foreign minister Boris Johnson added their own calls for Russia to accept responsibility for the incident. Investigators said the plane was downed by a Russian-made Buk missile, supplied by the country's 53rd anti-aircraft brigade in Kursk. Flight MH17 left Amsterdam on 17 July 2014, at a time when conflict between pro-Russian separatists and Ukrainian forces was at its peak. Although several Ukrainian jets had previously been shot down by pro-Russian rebels, many international airlines continued flying over the conflict zone. Investigators said they had evidence of the route taken by a Russian missile convoy, some 50km (30 miles) from the border between Russia and Ukraine, air traffic control lost contact with MH17. It soon emerged that it had crashed in the Donetsk area - controlled by pro-Russian forces. Early on in the probe, investigators concluded that a missile exploded extremely close to the passenger plane's nose, puncturing the hull with shrapnel. On Thursday, when investigators released their latest report, Russia continued to deny any knowledge. "Not a single anti-aircraft missile system from the Russian Federation has ever crossed the Russia-Ukraine border," the defence ministry in Moscow said. But both Ukrainian and US intelligence sources believe the Buk missile system involved was sent into rebel territory by Russia and then moved out again. On Friday, Kremlin spokesman Dmitry Peskov told reporters that the Dutch investigation did not include any Russian participation, but did include Ukrainian representatives. "Obviously as we did not have the chance to be a full participant, we don't know how far we can believe the result," he said. And Russian Foreign Minister Sergei Lavrov drew parallels with the poisoning of former Russian spy Sergei Skripal in the UK. "It looks much like the Skripal affair when they said that it was 'highly likely' done by Russians but Scotland Yard immediately said that the investigation is ongoing and will take some time," he told reporters on the sidelines of the St Petersburg International Economic Forum. "If our partners [an apparent reference to the Netherlands] decided even in this case of a greatest human tragedy, the death of hundreds of people, to speculate on it for achieving their political goals, I leave it on their conscience." Mr Lavrov added that he had discussed the investigation findings with his Dutch counterpart Stef Blok, who he said did not present any facts of Russia's possible involvement in the MH17 downing during their conversation. Russia had previously blamed a Ukrainian military pilot, Capt Vladyslav Voloshyn, who had flown a series of missions against the Russian-backed separatists. Capt Voloshyn apparently killed himself in March.